With summer in full swing, many of us are spending more and more time outdoors. Most of us have a back patio, deck or natural area in our yard where we can set up a relaxing space to enjoy during the warmer months. In order to truly create a space that is usable and relaxing, you must bring some elements that are inside your home to your outside space. Creating your own personal outdoor living space can be a perfect way to extend the usable area of your home, allowing you to have more room to entertain, gather with friends and family or simply enjoy a peaceful afternoon snuggled up with a good book! The possibilities are endless! Will it be a gathering space or a getaway space? Is it intended for entertaining guests, for gathering as a family, or as a small personal retreat? How you intend to use the space will dictate the size and the elements necessary to make it possible. If you want an area for cooking, you will need to plan for a grill or even brick oven. 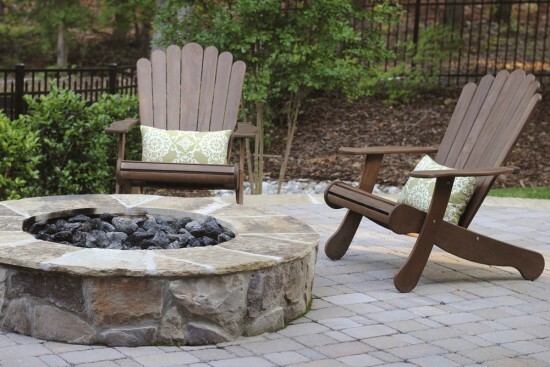 If you plan to spend summer evenings roasting marshmallows by the fire, you will want to consider adding a built-in fire pit or a safe area for a portable version. If you plan to use the area for quiet, relaxing afternoons, you may want to include a water feature for a more soothing atmosphere and even an area for hanging a comfy hammock. Typically, as an extension of the interior living space, you want the patio area accessible to the kitchen, dining and/or living area of your home for easy flow from one to the other as you entertain friends and family. However, if it’s intended as a personal little backyard getaway, you may want to find a quiet corner tucked under some shade trees. Consider existing landscaping, proximity to neighbors, and how to maximize any ideal views from your home. Walk all around the property and look at multiple vantage points as you consider the location and orientation of your new outdoor space. Not all outdoor spaces need a hard surface as a base; you can nestle a table and chairs in an existing natural area, under a grove of trees for an instant dinner party space complete with shade canopy and privacy! Don’t feel like you have to stop at just one space. Take advantage of every nook and cranny your property may offer! Don’t be afraid to use the entire backyard, carving out small, cozy areas that compliment a large entertaining area. You can even place different seating and conversation areas throughout to encourage guests to move throughout the landscaping. The great thing about a patio is that you are not limited to a certain shape. Use your imagination and draw it out on the ground with some landscape paint. People often underestimate how large an outdoor living space should be, especially if they intend to use it for entertaining. Consider how many people you will typically entertain in the space and try to design proportionately to your home. A nice rule of thumb is to try to match the dimensions of an interior living room space, if possible. The shape is often determined by the existing landscaping or topography. Try to work around existing trees (that can provide valuable shade!) and landscape plantings (which can save valuable budget dollars!). And don’t forget the ‘ceiling’ – if space and budget allow, adding arbors, trellises or umbrellas can not only help define space, support climbing vines, and add a vertical pop of color, and also offer much-coveted shade on hot summer afternoons! Let your existing home’s materials drive these selections. Choose finishes that will complement the color and style of your home. Add ambiance to long, leisurely evenings on the patio by selecting the right lighting for the space. Landscape lighting, sconces, and pendants are all wonderful, more permanent options if your budget allows. Even the soft glow of café-style lighting strung overhead or the glow of oil lamps and candles can add just the right low-level lighting to your outdoor living space without breaking the budget. Consider how you plan to use your new space as well as the size and scale of space when selecting new furnishings. 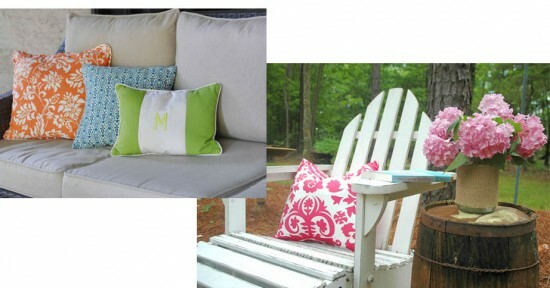 You want pieces that will last and that will be comfortable for you and your guests! 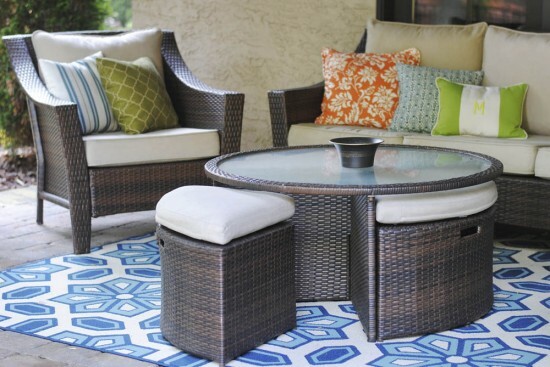 Keep in mind most outdoor spaces are all about casual comfort, so steer clear of formal, fussy options. Many outdoor furniture options tend to be large scale, so pay close attention to the size and proportions of furnishings, especially dining tables and sofa/chair seating. Don’t forget to include small pieces for accent tables for resting drinks or a good book; plant stands, vintage stools or even just a rustic, rough sawn chunk of wood can serve this purpose in a creative, unique way. As an extension of your living space, you want your outdoor patio area to reflect your personal style! This is also a wonderful place in inject that welcome splash of color you may have been hesitant to commit to indoors! Add some softness to the space with brightly patterned outdoor throw pillows and a bold outdoor rug; this will add some texture and give you a cozier feel. Use plants to add pops of color, fragrance, and interest around the sitting and entertaining area. Even consider adding a small potted herb garden near a dinner table to add a rich, fragrant smell and conveniently serve the cooking area. Use outdoor items in creative, unexpected ways; an old wagon or wheelbarrow can make a great drink cooler for keeping beverages on ice during an evening dinner party. Fill old mason jars, watering cans or pitchers with fresh cut flowers from around the yard for a fabulous finishing touch. As the days get longer and the temperatures continue to climb, bringing a touch of the indoors out can offer a wonderful retreat for family and friends to gather, relax and enjoy summer evenings under the stars.